The follow-up to her 2009 debut, Dandelion, finds young NOLA native Alexis Marceaux maturing into a songwriting force to be reckoned with. The opening track of Orange Moon is a dramatic, emotionally charged homage to her late friend Leila Foret (to whom the album is also dedicated) that puts Marceaux’s powerful and gorgeous alto front and center. Backed on this track by a brass section from Bonerama, Big Sam’s Funky Nation, and a host of other New Orleans horns, Marceaux’s vocals soar and dive within a modern second-line with a loose yet forceful intensity. This yin and yang is prevalent throughout, and makes for a compelling mix. The pure indie-rock of “Fox” (think Decemberists, Fleet Foxes) and the resplendent beauty of bossa-nova jazz on “Only One Basket” meld easily with the album’s straight-up Cajun/Zydeco, near-sacred anthems, and angelic hymns. 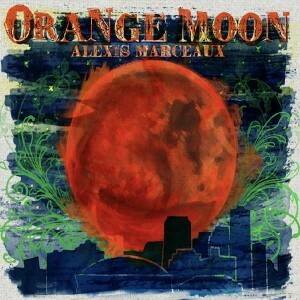 As for Marceaux’s maturity as a songwriter, Orange Moon is a work rife with metaphorical battles: personal relationships (“Who the hell are you to shake things up when I’m fine on my own”) in “Sur Mon Chemin” (on my way); her friend’s battle with cancer in “Leila and the Orange Moon”; New Orleans’ struggles after Hurricane Katrina, and the Gulf region’s degradation after the Deepwater Horizon oil-spill fiasco last year. Regarding the latter, “Wishing Well” is sung from the perspective of a pelican (the Louisiana state bird) lamenting the sorry and oily state of its habitat. Marceaux croons “I just want to spread my wings and sing like a songbird sings, but suddenly I’m overcome with fear,” and then spits caustically, “And you suckers will be lucky if I ever come back.” The song, and the album, close with a whispered “Au revoir, au revoir la terre de mon pere” (Goodbye, land of my father). Produced with longtime Glasgow partner Sam Craft, engineering “magic” by Polyphonic Spree’s Rick Nelson, and joined by dozens of NOLA’s finest musicians, Orange Moon is a full and heady work. The only downside, at a mere eight songs, with “Leila’s Reprise” at under a minute yet surprisingly stirring, is that we’re left wanting much more.